Deidre's Discoveries: DIY! Homemade Lip Scrub! So there I was. At home on a Saturday night. Bored, and chewing my lips. I realized my lips were dry, and somewhat peely. Even though I've been applying lip balm quite often, they still didn't feel as soft or smooth as I would like. So I thought, hmmm... maybe I should finally try a lip scrub. 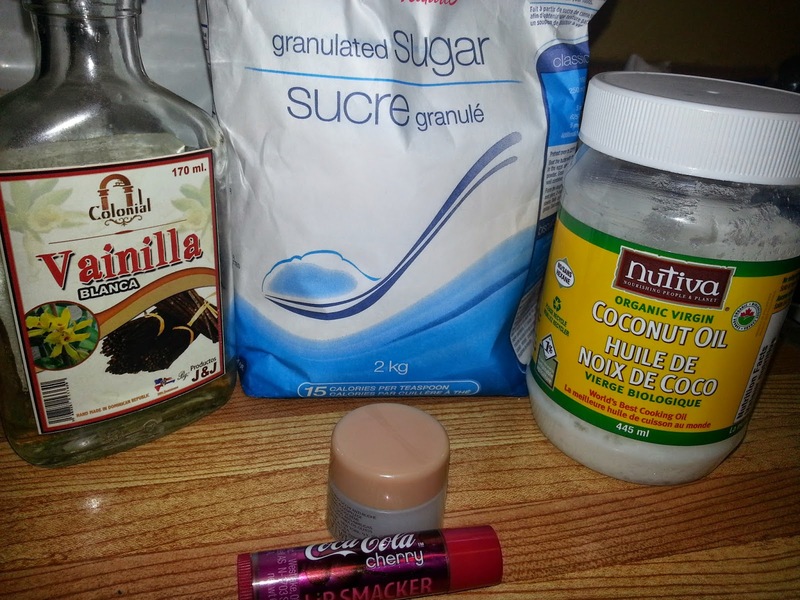 I've never tried one before, and I certainly don't have the budget right now to go out and buy one, so I decided to Google homemade lip scrubs. They seem easy enough to make, with ingredients that everyone has around their house. It depends if you want to add something different to yours or not. From what I could see from my two second search, that it would take only a few minutes (if that!) to make a simple lip scrub. I headed to the kitchen and pulled out whatever ingredients I thought would work well in this concoction. In my searches, I found that you could use regular granulated sugar, or brown sugar. I would have preferred to use brown sugar in this one, but we don't have any at the moment. So granulated white sugar it was! I also found on Google that you should use honey, olive oil, or coconut oil to use as your "liquid" - just enough to make the sugar sticky, and turn into a paste. I opted for coconut oil because I don't like honey, and I thought coconut oil might be better over the olive oil. I added some vanilla because I'm not a huge fan of the scent, or taste of coconut oil. This specific vanilla I picked up while I was in the Dominican Public before, hence why it is called Vainilla - lol. They spelled it the way they pronounce it. Cute. It also has a good quality taste, it's clear, and it has just a touch of cinnamon, to me at least. The smallest pot container I could find was an old sample of an eye cream. So I made sure to wash it well and dry it before using it. The added coca cola cherry chap stick is there because I thought I could mash a little bit into my scrub to give it a nice pinkish tone, and cherry scent. I used about a tablespoon of white sugar, and couple of drops of already melted coconut oil (it tends to separate when the air is warm) and a little tiny drop of vanilla. 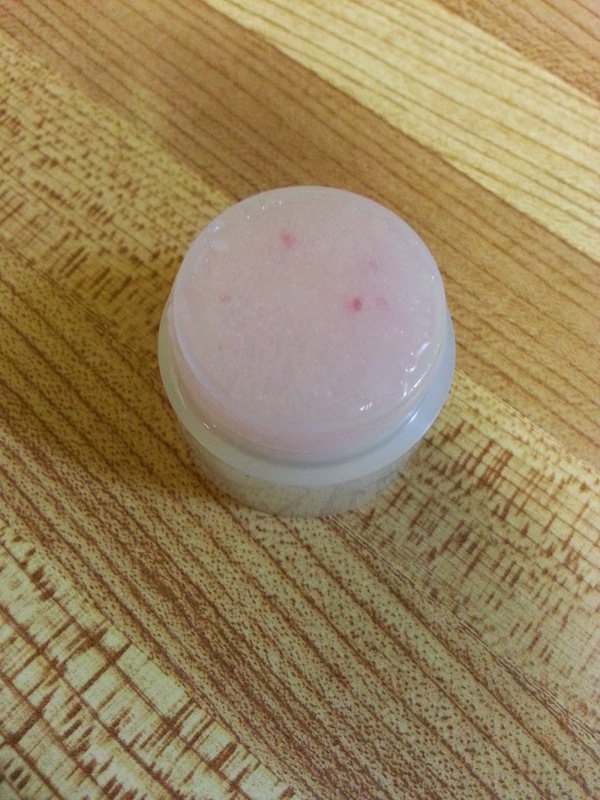 I scraped a small amount of lip balm as well into the bowl and mixed it all together until it formed a paste. I did end up sprinkling a little bit more sugar in because I felt the mixture was too wet. Once it was the right texture, I spooned it into my little container, that apparently wasn't big enough for my mixture, but its okay. 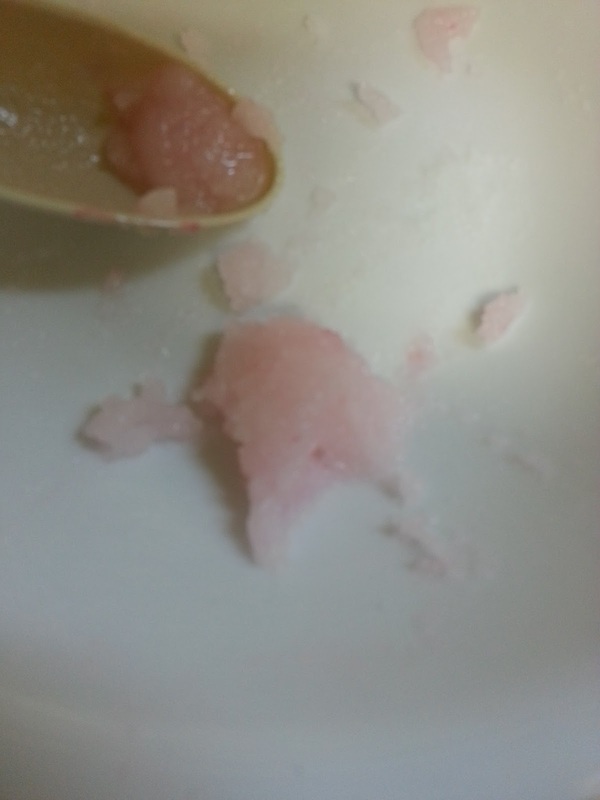 As you can see the lip balm didn't mix very well into the sugar scrub. If I were to make it again I wouldn't add that, but that was my mistake. I could definitely see myself making this again in the future. I'd like to play around with it some more and create the perfect scrub. Online recommends that you only use the scrub once, maximum twice per week, and to use a moisturizing lip balm afterwards.